Yesterday was BLACK FRIDAY as they call it, was a fun day. I had intended to JuMp out of bed at 5:30am and rush to the stores to get the bargains. When I woke up at 5:45am and looked at the clock and felt the chill, I snuggled back under the covers til 8am. I was at walmart and got some cute shirts for my nieces for Christmas for $4 EACH!!! 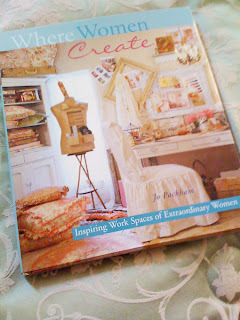 I also went searching for the Cricut Expressions which was suppose to be on sale for $199. Now, I didn't expect it to be there but when I looked in the scrapbooking section and saw the empty slot, I knew they were gone. There was a sales ladies a few aisle's away and we struck up a conversation laughing about the crowds and her trying get work done while people asked her questions so I asked her about the Expressions. She said you know they may have put some over in the material aisle so check there and electronics. Well, I wasn't going near Electronics as it WAS a madhouse so off I went to material. Taa Daa there they were on the end of the aisle! I deemed this a sign that I should have one :} so I threw it in my basket and happily sang christmas carols to myself as I wandered through the store. I wanted to mention my NEW Christmas banner too. I had my blog banner professional, Sandy of The Blog Banner Queen from Canada make me my holiday banner. Isn't it cute? 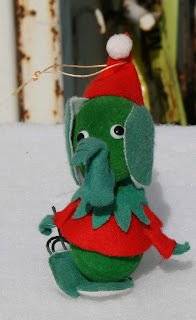 She always does such a good job and I sent her some photos of the doggie, bird and santa in the banner and she does her magic and makes them pretty and interesting. When you get a chance, check out her blog too because she has some beautiful works of art going on. 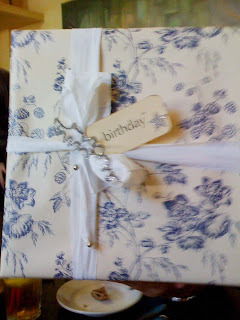 I leave you with pics of a beautiful paper bag book I purchased last year and must use this year. Let me know the deals you got on Black Friday! 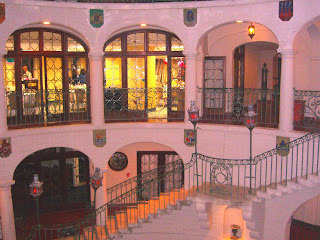 Always love to hear about great deals :} HAVE A WONDERFUL DAY! Now, I don't know about you but my skin is dry and the heels of my feet are cracked and dryed.....it's really an ugly thing but I saw on Oprah some beauty hints and one was about making your feet BooTeFul and smooth by using Stridex and Vaseline on your heels at night to clear up that dry skin...hope it works. Well, since I had Vaseline on my hands I decided to do some Vaseline resist type art. 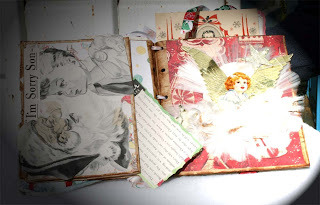 I got a digital collage sheet from Retro Cafe she calls them "Hello Dollie German Heads". 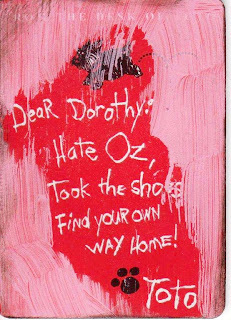 For this ATC card I used a cute Oz playing card. I adhered the dollie head with gel medium and covered the face with gel medium too. I let it dry then I spread Vaseline on the face and any part I wanted to show through after finishing. I then painted the entire surface with pink acrylic paint and let dry. After the card was dry, I took a tissue and wiped away the part that had vaseline on it. Wa LA my Vaseline Reist! I took some stazon ink and inked the edges. The rest you can guess. 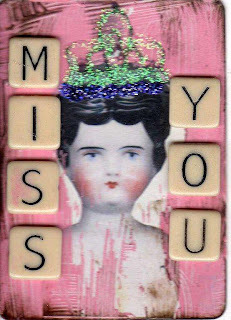 Now my second fun Vaseline piece.....First for the background piece I am using a piece of tin so that I can use it as a magnetic board. I spray painted the entire 5 x 7 tin piece with white paint and let dry. I cut out one of the bigger dollie heads from my collage sheet and ahered it with gel medium back and front and let dry. 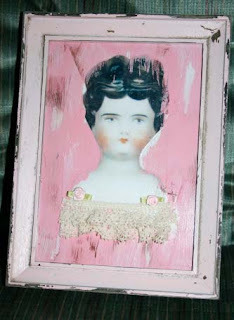 Rubbed the Vaseline over the face part and painted with pink acrylic. I let dry and rubbed the vaseline off the face and WA LA....AnOtHeR vaseline resist. 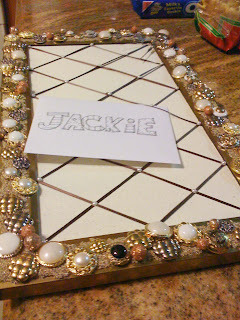 I glued the tin piece to the shabby chic frame and added lace for a neck piece. 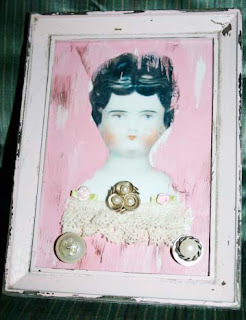 The 3 buttons are magnetic so this little framed collage can be cute and useable as a small memo board. It’s My Birthday and I’ll Cry If I Want too! My 60th birthday was Monday, November 10th. I was watching the CBS Today show and they were showing the lifestyle and the highlights of the 60’s. It did bring tears to my eyes to think I had lived through many a historic moment. At the time, it was just LIFE growing up and shared moments…. Staying up late with my father to watch the first man walk on the moon. We marveled at the feat. Getting up early with my Mother and standing with a crowd at the Sears entrance waiting for it to open so we could rush in to search for bargains. My Mother letting my sister and I take a day off from school and going to the movies and watching Gone With the Wind….sobbing and eating Bons Bons. Watching the Beatles on the Ed Sullivan show and my parents shaking their heads. Going to the high school dance and the band “The Spiders” playing great tunes as my girlfriends and I were drooling over there band manager. Oh by the way, “The Spiders” changed their name to “Alice Cooper”. Watching the election of JFK, watching the funeral of JFK and crying. Watching Martin Luther King give his “I Have a Dream” speech on TV, hearing the sad news he had been killed. The Vietnam war, the protests, hippies and more. One important thing I have learned as I get SOOO OLD ha ha is that friends make my life so much better. 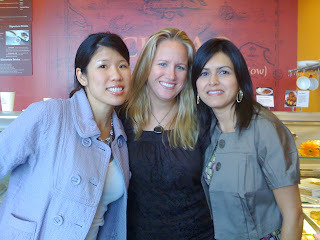 I enjoy the camaraderie and the inspiration that each friend brings into my life. So I am crying tears of joy to know that somehow I have been blessed to find a wonderful circle of friends that support and inspire and make me laugh. How great it is to have friends that not only remember your birthday but spend time with you and make more valuable memories. 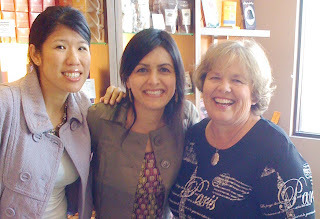 On Monday Maryam invited me to a little store, Chuao, Chocolatier for a yummy birthday celebrate. Melanie and Elena made it a party. 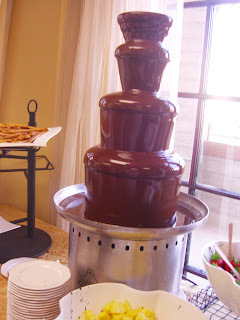 Gelato, chocolate….. such fun. Tuesday, November 11 more celebrating for me. 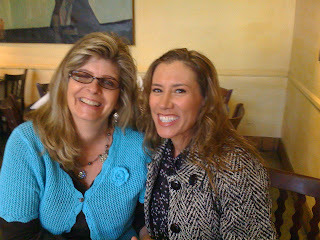 Lucky me………Bonnie and Jane took me to lunch and we did some shopping at Solo in Solano Beach. 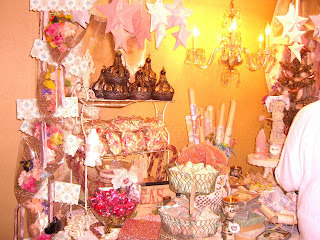 What a wonderful shop. 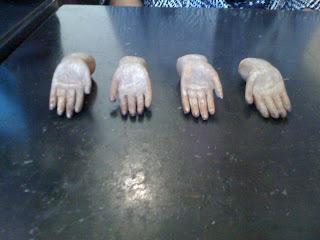 Look at these little Santos hands we found there…cute huh? Presents? Yes there were lots. Bonnie gave me …….wait for it……. 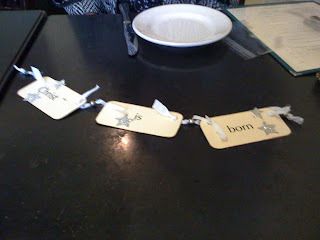 At lunch Jane shared some the things she has been working on……..check this out…..need better pics but these cards can be printed on your printer, embellished and tied together with strips of material and beads and used as garland on a tree, put on the wall, put on a package…ideas endless………..what a fantastic idea! 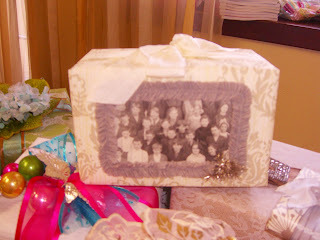 Memories make me cry but that is not necessarily a bad thing on my birthday. It WAS my birthday and I’ll cry if I want too :} Thank you all my friends I hope you know how special you are and how I am sincerely happy to know YOU. 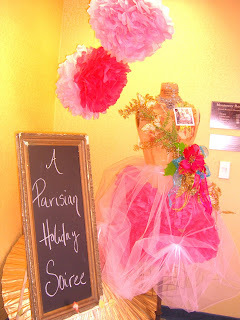 Part 3 - Parisan Soiree - Creativity and Celebs! 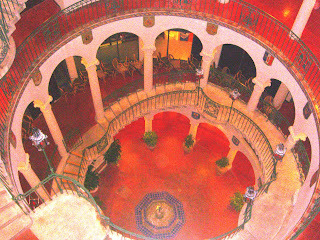 Part 3 is the Creativity of the Soiree. 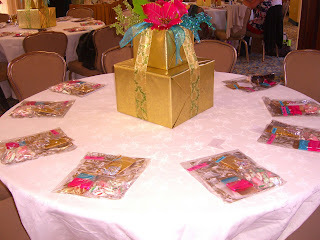 Heather had complete packages for each of the attendees to create a Lavish Bon Bon and Bijoux Ribbon Ornament. Such fun! 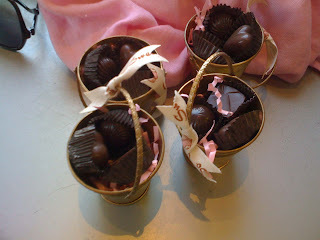 The Bon Bons are packages of hard candy that you ball up in tissue, wrap with more tissue and twist at the ends but add clear plastic to make it even more elegant. 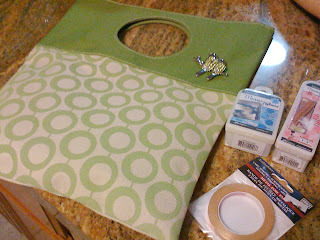 Then add ribbons and a seal. Celebs, okay maybe it wasn't Martha Stewart or Oprah but I think of them as Celebs. Jenny Doh and Staci Dumoski from Stampington. 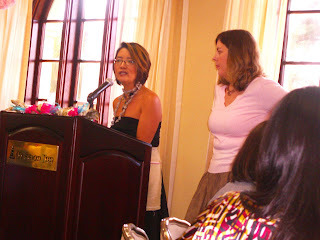 They shared some insight in the magazine Artful Blogging. How to submit items for publication and the ins and outs of getting a magazine out. 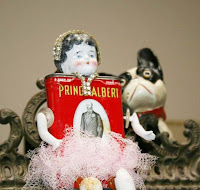 FYI April 2009 they will have a new magazine coming out MARIE based on Marie Antionette art which is so popular. Can't wait for my copy! Oh and did I mention there were DOOR PRIZES? 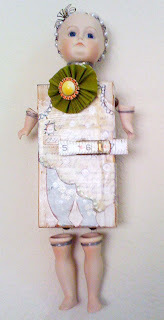 I won this wonderful paper doll so cute and artsy. One of the fun "activities" was Heather sharing some of her vintage and unique gift wrapping ideas. 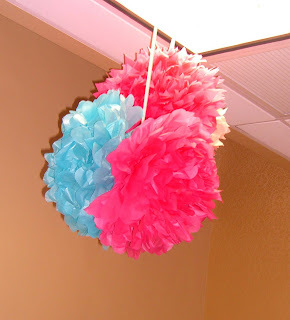 Wow a party and I learned something! 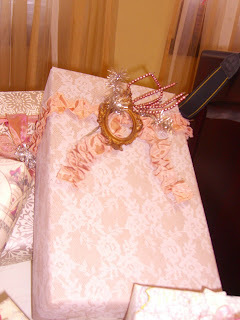 I was so inspired and can hardly wait to wrap some gifts. 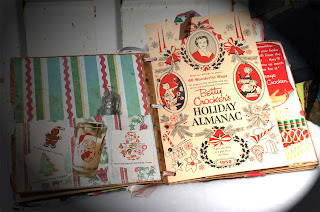 She used vintage paper, buttons, wall paper, maps and more. I LOVED this! It was getting dark and we hated to leave but all good things must end (for awhile). 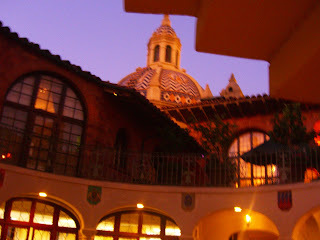 So on the way out I tried to capture a few pics of the Mission Inn. Have you been there? I never have and know I must return to take in it's beauty. There were 3 weddings that day at this Mission. Thanks for visiting, hope you enjoyed the pictures. We had fun! Heather pulled out all the stops and had an elegant gathering. 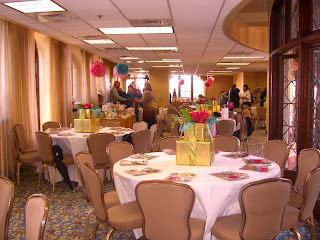 The room had a great feeling of elegance and holiday spirit. 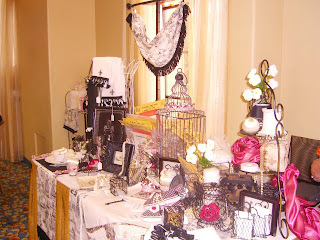 There were 6 vendors with jewelry, vintage, decor items, tea and scones and more. 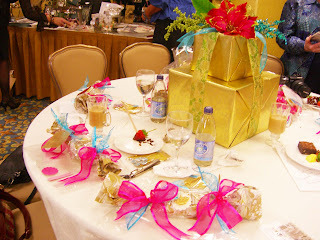 Each table had a center piece with BIG wrapped holiday packages and at each place setting there was a cellophane package containing some creativity to come later in the party. 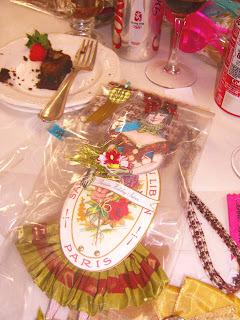 Each package had a vintage jeweled lapel pin. 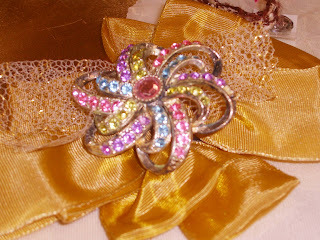 Of course, we had to decide which jeweled pin we wanted and lots of swapping was going on to get just the right color pin we would love. 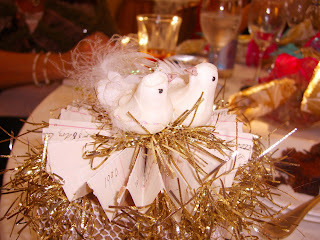 Actually I ended up with the original one at my place setting but it was fun looking at them all. 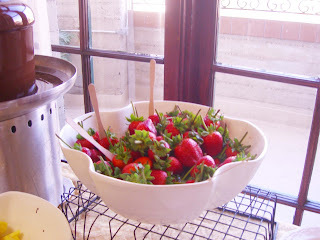 More about what we did with them later. 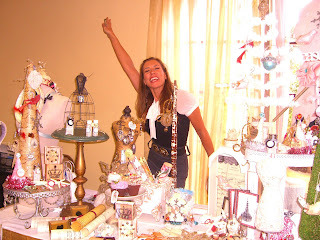 The vendors had wonderful and fun items for sale. 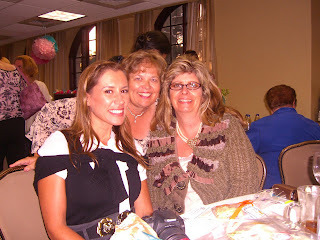 There was Jane from Art Takes A Village, a non-profit to bring art therapy to women's shelters. 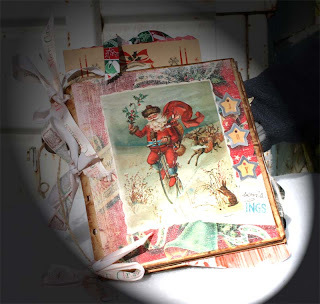 Jane creates from the heart and with an elegant and vintage style. 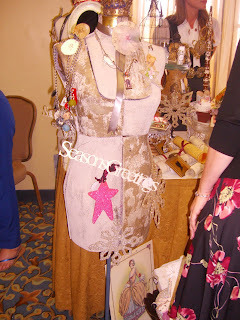 Of course, Heather's booth was there and it was so fun to see some of her wares in person. She does find some of the most wonderful items. 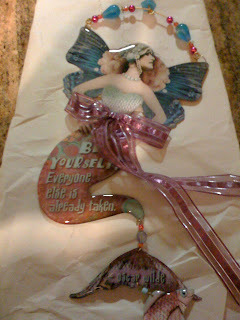 There was some oh so creative jewelry by Beth Quinn, Mixed Media Artist. Bonnie got a necklace and bracelet and Jane got a bracelet. 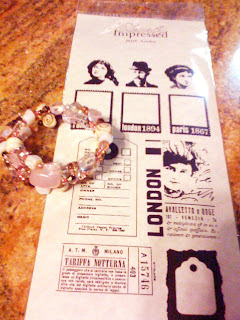 Check out her unique cloth bracelets, they are soooo cute and original. 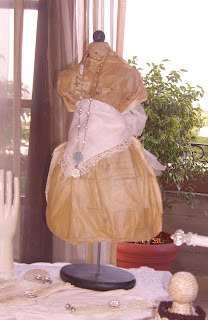 Check out the cute little dress form with pattern paper to dress her....sooo cute. Another great and generous vendor, Orange Blossom Tea House. 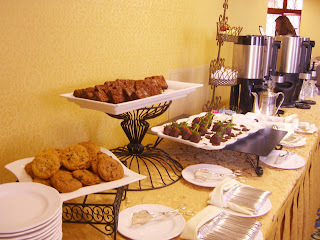 A little tea and scones and china make a great day for us all. 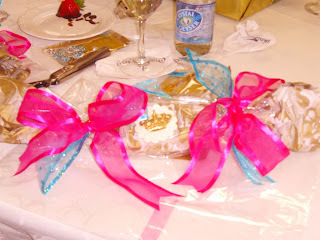 They generously donated a yummy scone in a little take away package for each attendee. They are yummy. I had a picture of their table but it didn't turn out darn. There was Mary Violasse, who is a store owner in the Riverside area. 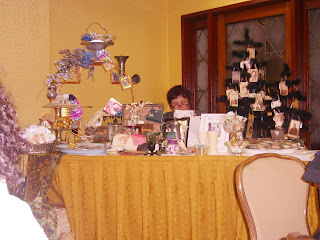 She had GREAT vintage items. 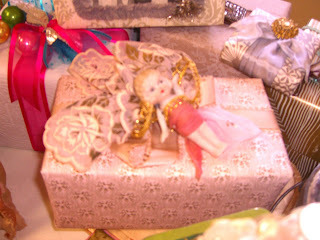 Collectible books, jewels, christmas ornaments, etc. Lots a great finds. I WANT to go to HER store TOO!!!! 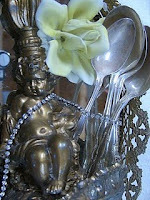 Well on to my last post about the day.........see there are tons of pictures and so much to share.